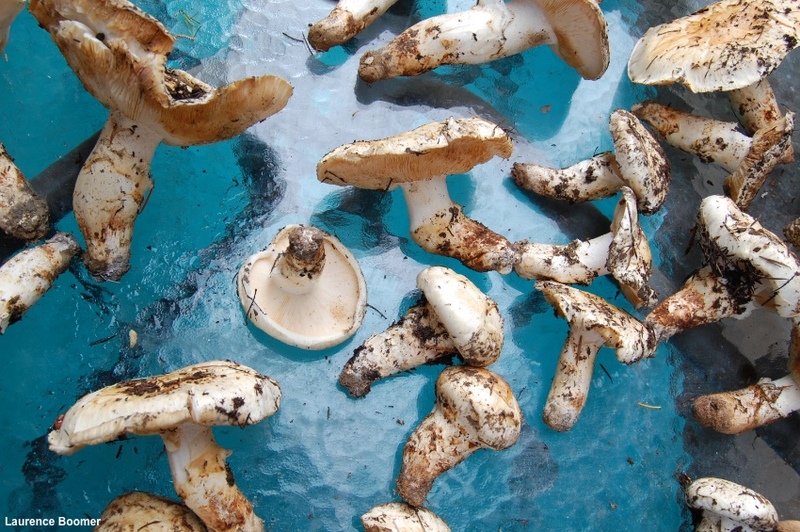 This is the western North American version of the "matsutake" mushroom, found primarily under conifers in fall, after summer-like temperatures have begun to drop. Often, Tricholoma murrillianum is found buried nearly to its apex in needle duff, creating a "mushrump." 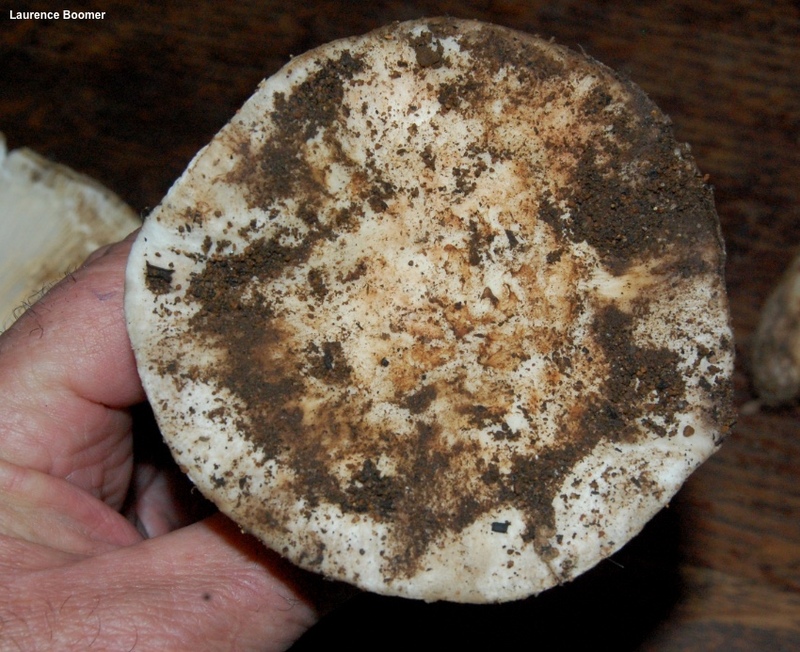 When young Tricholoma murrillianum is white, but it soon begins to develop brownish discolorations. 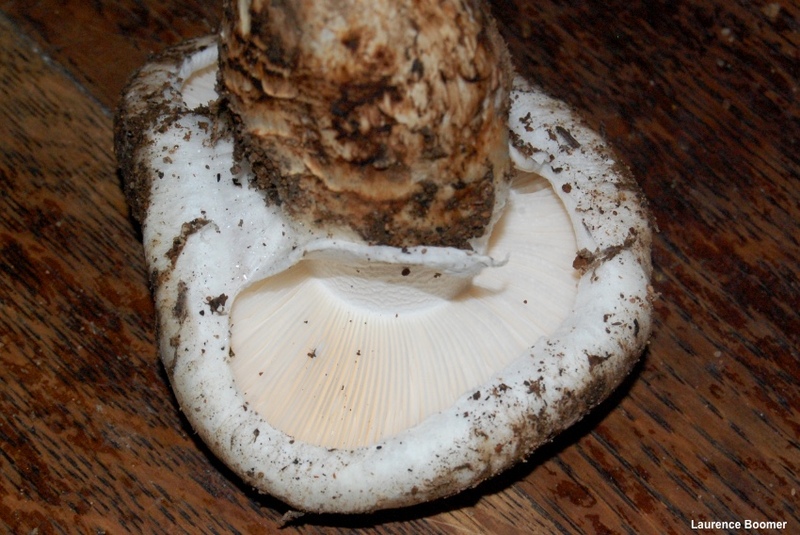 It features a prominent partial veil which covers the young gills and later forms a sheathlike covering on the lower stem, with the upper edge flaring outward to form a ring. The gills are crowded and attached to the stem, sometimes by a notch, but do not run down it. The spore print is white. However, the odor of the species is its most distinctive feature. "Spicy but a little bit foul" is what comes to my mind, though I like "a provocative compromise between 'red hots' and dirty socks" (Arora 1986). 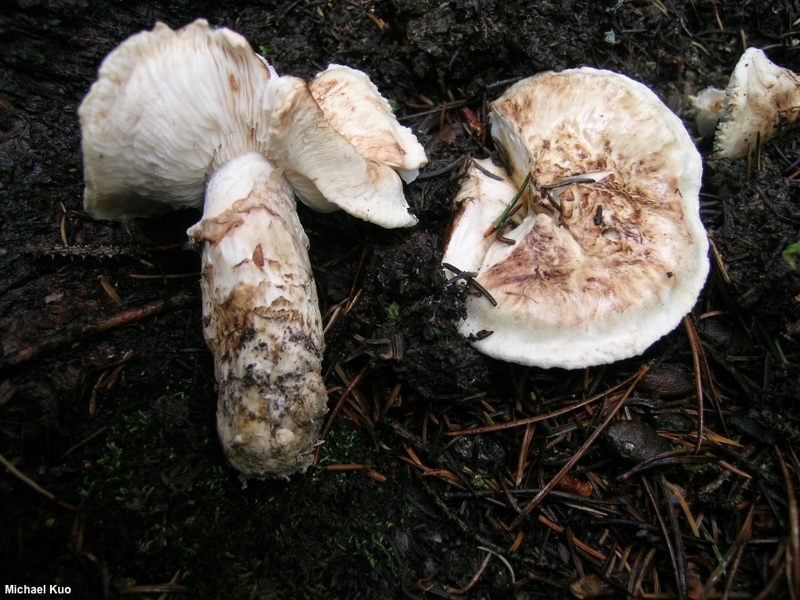 The name "Tricholoma magnivelare" has long been used for the western North American matsutake, but recent research (Trudell et al. 2017) indicates that Tricholoma magnivelare is only found in eastern North America, while the range of Tricholoma murrillianum extends from the Rocky Mountains to the West Coast. In Mexico, Tricholoma mesoamericanum replaces its more northern counterparts. While these species are not easily separated on the basis of physical features, their ranges do not appear to overlap, and their ITS sequences separate them clearly. Thanks to Laurence Boomer for collecting, documenting, and preserving Tricholoma murrillianum for study; his collection is deposited in The Herbarium of Michael Kuo. Ecology: Mycorrhizal, primarily with conifers (including lodgepole pine and other true pines, Douglas-fir, hemlock, and fir), but also found in association with tanoak and madrone on the West Coast; growing alone, scattered, or gregariously; western North America from the Rocky Mountains westward; fall, and (in warmer climates) winter. The illustrated and described collections are from Colorado and Oregon. Cap: 5–10 cm; convex becoming broadly convex or nearly flat; dry or a little sticky; white at first, but often developing brownish to brown appressed fibrils and small scales; the margin inrolled when young. Gills: Narrowly attached to the stem, sometimes by means of a notch; close; short-gills frequent; white to ivory; sometimes developing brown or reddish brown stains and spots with age; at first covered by a white partial veil. 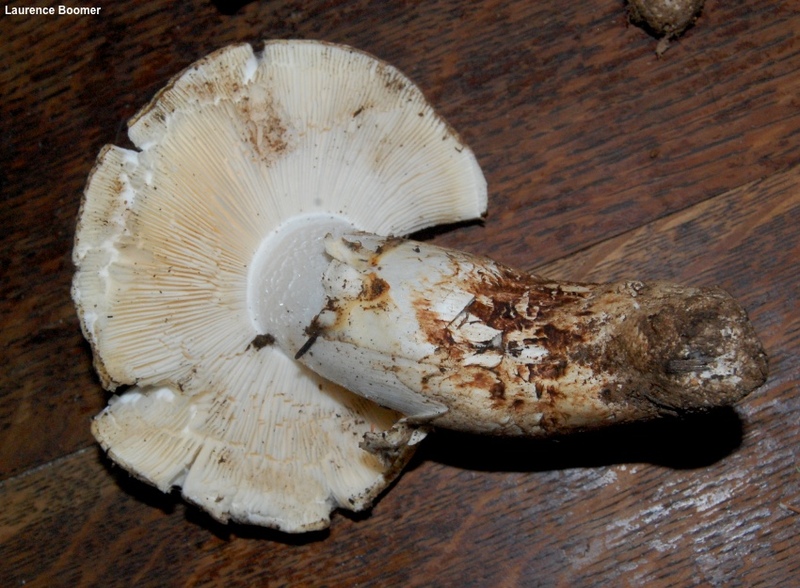 Stem: 4–10 cm long; 1–2.5 cm thick; more or less equal, or with a slightly tapered base; white above the ring, but developing brown colors, like the cap, below; partial veil white and thick, collapsing to form a sheath around the lower stem and a prominent flaring ring at the top edge of the sheath. Odor and Taste: Odor strong, fragrant, and distinctive (see comments above); taste spicy. 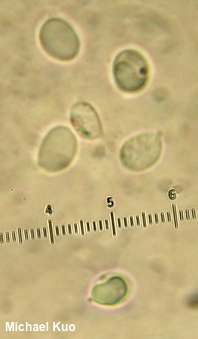 Microscopic Features: Spores 5–8 x 4–6 µm; ellipsoid to nearly subglobose, with a small apiculus; smooth; hyaline in KOH, often with one large oil droplet; inamyloid. Cystidia not found. Pileipellis a cutis; elements 5–7.5 µm wide, smooth, hyaline to yellowish in KOH. Clamp connections not found. REFERENCES: Singer, 1942. ("Tricholoma magnivelare" & "Tricholoma matsutake": Smith, Smith & Weber, 1979; Ovrebo, 1980; Arora, 1986; Phillips, 1991/2005; Lincoff, 1992; Shanks, 1994; Hosford et al., 1997; Bergius & Danell, 2000; Chapela & Garbelotto, 2004; McNeil, 2006; Kuo, 2007; Trudell & Ammirati, 2009; Kuo & Methven, 2014; Desjardin, Wood & Stevens, 2015; Evenson, 2015; Cripps, Evenson & Kuo, 2016; Siegel & Schwarz, 2016. Tricholoma murrillianum: Trudell et al., 2017.) Herb. Kuo 08291101, 10171303, 11051301.